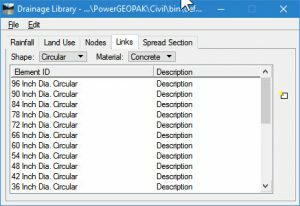 Taking a look at a GEOPAK Drainage library, we see that pipe(link) library items are size specific. InRoads S&S is the same in this regard. 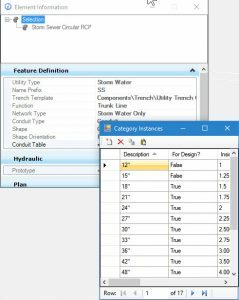 However, in SUDA a single Feature Definition can be configured to contain all expected sizes for the designated material and utility type. 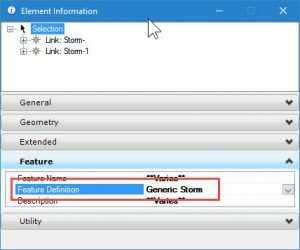 In order to take advantage of the automatic matching when you import, you must structure the SUDA Feature Definitions to be size specific and exactly match the legacy library item name. This makes a LOT more Feature Definitions which you must potentially maintain forever. It is probably better to forego the Feature Definition matching capability for pipes and then change the pipe Feature Definitions after the import is finished. This is very easy to do. After the import, you will have many very cool looking nodes connected by many very ordinary looking pipes of various sizes. Simply select all the pipes using Selector or Select By Attributes or whatever. Then change the Feature Definition of the entire selection set in Element Information. The Feature Definition is changed and the sizes are matched to the closest matching size in the Feature Definition you choose. Thank you for publishing this helpful information. Are you aware of any recent Bentley updates for OpenRoads and/or SUDA that has helped to simplify the export process from Geopak Drainage (legacy) to SUDA? 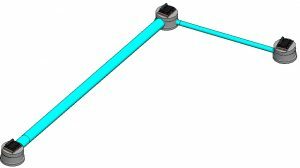 Or will it still be the same process as what you have mentioned in this blog for pipes (as well as nodes)? In the past I’ve tried, I’ve come up with errors so found the export process to be difficult. I am not aware of any changes to how this process is handled, so the process should continue very similarly to what is outlined.